Andaliman (Zanthoxylum acanthopodium) is a species of flowering plant in the citrus family, Rutaceae. Its range includes southern China (western Guangxi Guizhou, Sichuan, Tibet Autonomous Region, and Yunnan), Bangladesh, Bhutan, northern India (Arunachal Pradesh, Assam, Manipur, Meghalaya, Mizoram, Nagaland, Sikkim, Uttar Pradesh, and West Bengal), Nepal, Laos, Burma, northern Thailand Vietnam, Indonesia (northern Sumatran highlands), and Peninsular Malaysia. 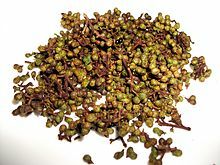 Much like the closely related Sichuan pepper (Z. piperitum), the seed pericarps are used as spices in cooking and have a similar tongue-numbing characteristic. However, in cooking, the flavour of andaliman has lemon-like notes (similar to those of lemon-grass) as well as a hint of the aromatic pandan leaf. ^ a b "Zanthoxylum acanthopodium". Germplasm Resources Information Network (GRIN). Agricultural Research Service (ARS), United States Department of Agriculture (USDA). Retrieved 2013-05-12. This page was last edited on 17 April 2018, at 10:27 (UTC).